If you love almonds, these bars are going to light your fire. Seriously. They have the most saturated almond flavor of any food item I have ever encountered. That is why I called them Almond Fantasy, because they are beyond reality, beyond any other everyday almond flavored thing you have ever eaten. 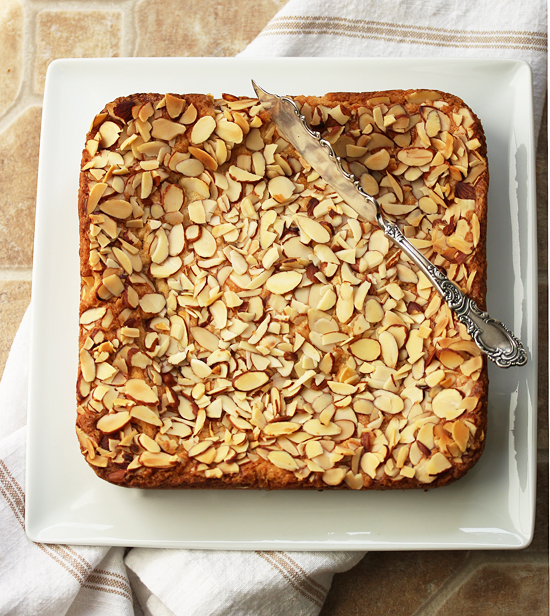 They are made with almond paste, almond extract and sliced fresh almonds. You really need to make these bars. Really. Almonds are native to the Mediterranean climate region of the Middle East, and eastward as far as the Indus River in Pakistan. From there they spread around the Mediterranean to northern Africa and southern Europe. Almonds were introduced to California in the mid 1700s by Franciscan monks who planted the trees to grace their missions along the coastal El Camino Real. By the 1870s the trees were successfully planted inland in the Sacramento and San Joaquin areas of California’s great Central Valley. In 1910, almonds were a minor crop in California. The Blue Diamond company was instrumental in working with the US Government to obtain protective tariffs as California growers developed orchards. After WWII the almond industry became firmly established and today 6,000 California almond growers produce 100 percent of the commercial domestic supply and 80 percent of the world’s supply. The pollination of California’s almonds is the largest managed pollination event in the world, with close to 1.6 million hives (nearly half of all beehives in the USA) being trucked in February to the almond groves in the San Joaquin Valley. This is managed by pollination brokers, who contract with migratory beekeepers from at least 49 states. Yea! Go Bees! My Almond Fantasy Bar Cookies are made with Odense Almond Paste, which is manufactured in Denmark, using the finest California almonds that have been blanched, mixed with sugar and rolled through Italian millstones. 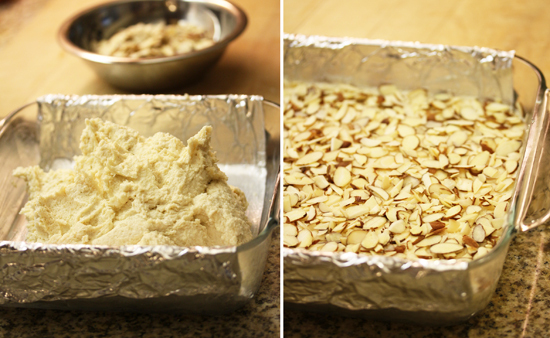 The dough is spread in a foil lined pan with an offset spatula, brushed with beaten egg white and sprinkled with sliced almonds. After cooling, you can lift it out of the pan with the foil handles and cut it into the size bars you desire. I cut mine into one inch squares, because they are so intense, a little goes a long way. I served these, along with small squares of banana cake topped with cream cheese frosting, to my guests over the holidays. They made everyone really happy. So good. 1. Preheat oven to 350 degrees F. Butter a 9-inch square baking pan, then line with foil, leaving a 2 inch overhang on 2 opposite sides, and butter foil. 2. Pulse almond paste in food processor until broken up into small bits. Add salt and ¼ cup sugar and continue to pulse until finely ground, about 1 minute. 3. In an electric stand mixer with paddle attachment, beat together butter and remaining ½ cup sugar at medium-high speed until pale and fluffy, about 3 minutes. 4. Add almond mixture, egg yolk, and almond extract. Beat until well combined, about 2 minutes. 5. Reduce speed to low, add flour and mix until combined. 6. Spread batter evenly in pan with offset spatula. Brush some of lightly beaten egg white over batter and sprinkle with sliced almonds. Press lightly to adhere. 7. Bake until top is golden, 40-45 minutes. Cool completely in pan on rack, about 1 hour. Transfer with foil to cutting board, discard foil. Cut into bars. Note: Cookies keep, layered between parchment, in airtight container at room temperature 4 days. Freeze for 2 months wrapped in foil in plastic ziptop bag. My parents are coming to town and they love ALL things almond. 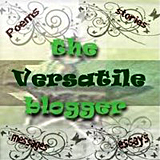 I will be making this one for sure. 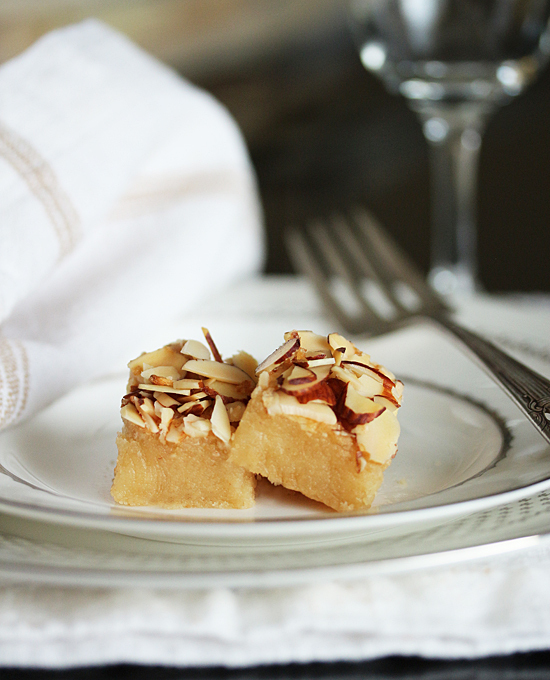 I really love almond, so I am definitely making this…thanks so much for sharing. I have to try these for my mother while she’s here in town as she, too, LOVES anything almond! Lovely recipe and pics, Lynne! 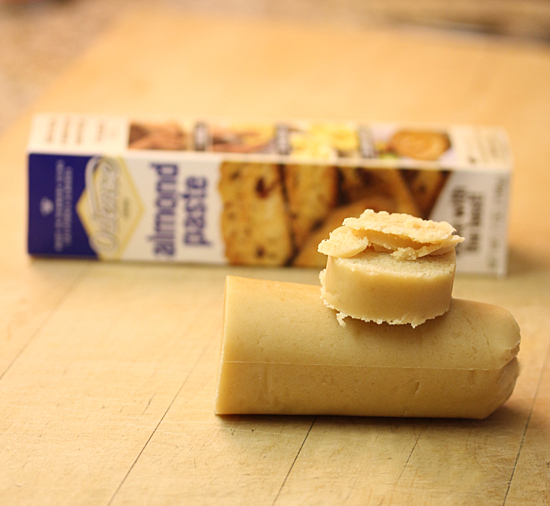 I don’t know just what it is, but the older I get, the more I enjoy almond paste. When I was young, even all the way through my thirties I never cared for it. But over the last thirty years or so, (Yes, Virginia, I am that old) I have developed a real passion for the taste of almond. I bet these cookies are absolutely divine. 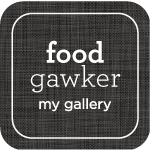 You always present the most tempting food, and you have such a range of skills. I really enjoy visiting your site. I know something good always awaits my arrival. Has anyone made these with a gluten free flour.